Never travel in the UK by train on a public holiday! On Monday we hopped off the train at Birmingham New Street only to find that our train to Oxenholme had been cancelled. But no one told us this. We ran into the Virgin trains information area because we couldn’t see our train on the departure board. The Virgin staff told us that we had better run because the train to Crewe, where we could get another train to Oxenholme, was just leaving from platform 4c which was only visible if you ran the length of 4b which we fortunately did – by mistake. The train to Oxenholme and eventually Glasgow was packed and running an hour late. Some people had been on the train from Euston Station since 7 that morning and it was now nearly 6 at night. To cut a long and tedious story short we made it to Windermere and found our B&B easily. 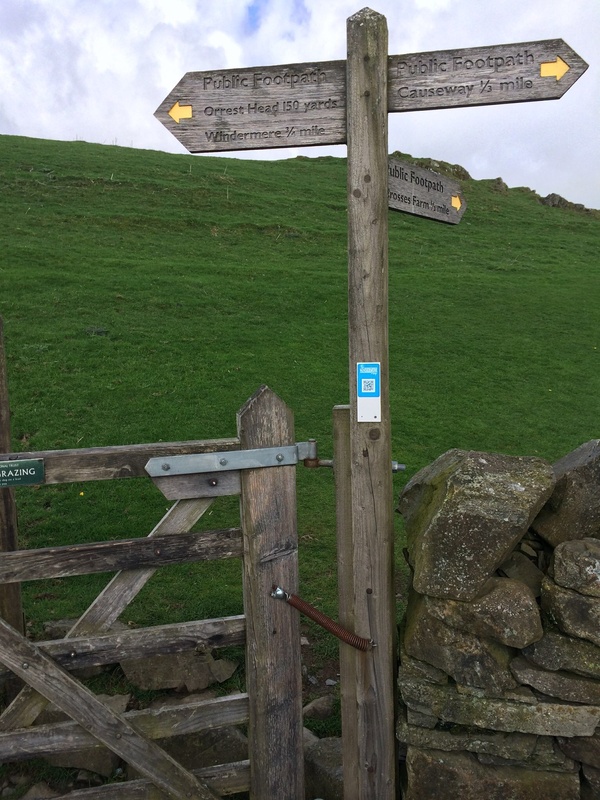 These signs are called ‘finger posts’. They are very useful. Far better than ‘way marks’. Tuesday, the first day of our walk, was sunny with no wind and bright blue skies. The world was looking gorgeous, all that we had hoped for. White sheep, black sheep, brown sheep and grey sheep, sheep with black legs, black faces and some very cute lambs with black ears and noses were dotted around every bright green field. The lambs were newly born and most of them had an identical twin. 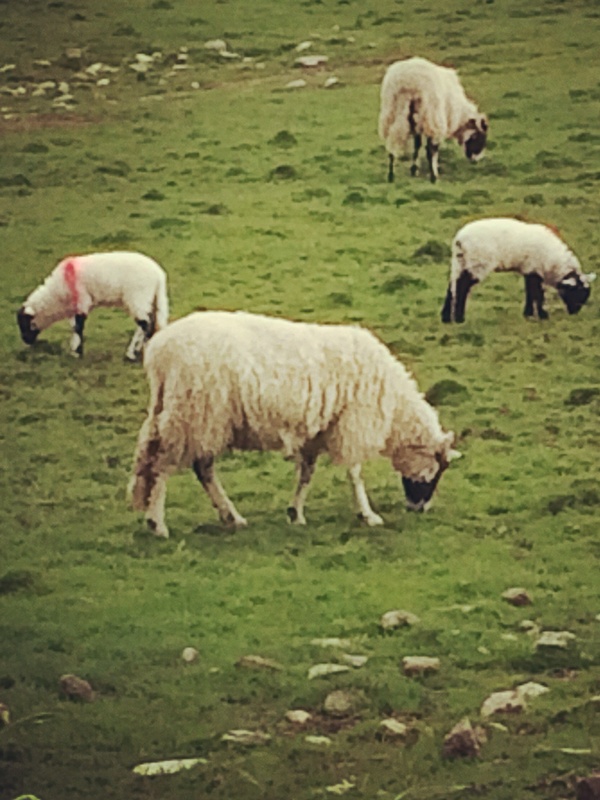 We couldn’t find green sheep. Maybe he was hiding behind a bush, fast asleep. We had our instructions written out by the company that organised our walking tour and accommodation. They also transport our bags from B&B to B&B so we don’t have to carry them. We felt like we were going on a treasure hunt. Finding yellow ‘way marks’ looking for stiles and gates, trying to work out paths through fields that have been overgrown by grass and finding that our estimate of distance didn’t match theirs. Fortunately we have maps and a compass as well. On the first day we set off at about 9 for our 17 km trek. We usually knock over 6km at home in about an hour so we thought it may take us until lunchtime to get there. 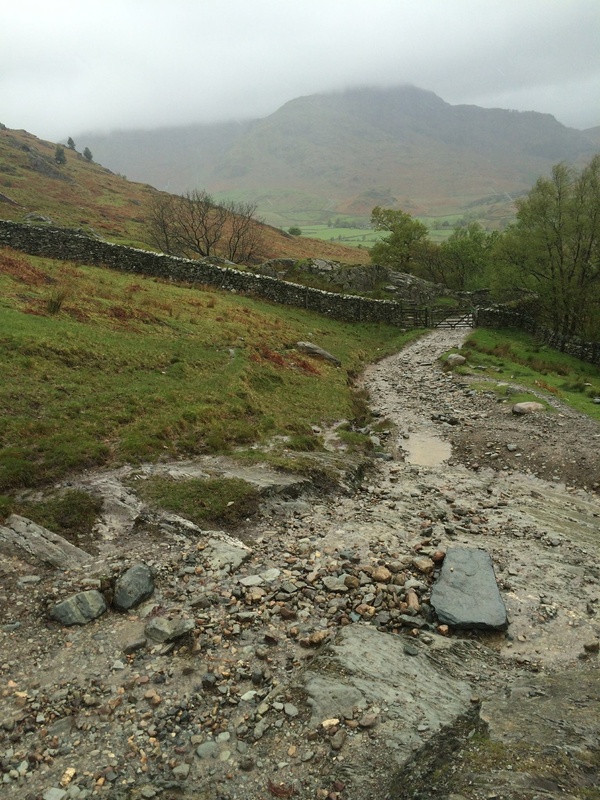 We were not counting on the gravelly paths, undulating fells and boggy fields. It took us about 5 hours of walking and we stopped for lunch at a cafe so we arrived at about 3 in the afternoon at Grasmere. 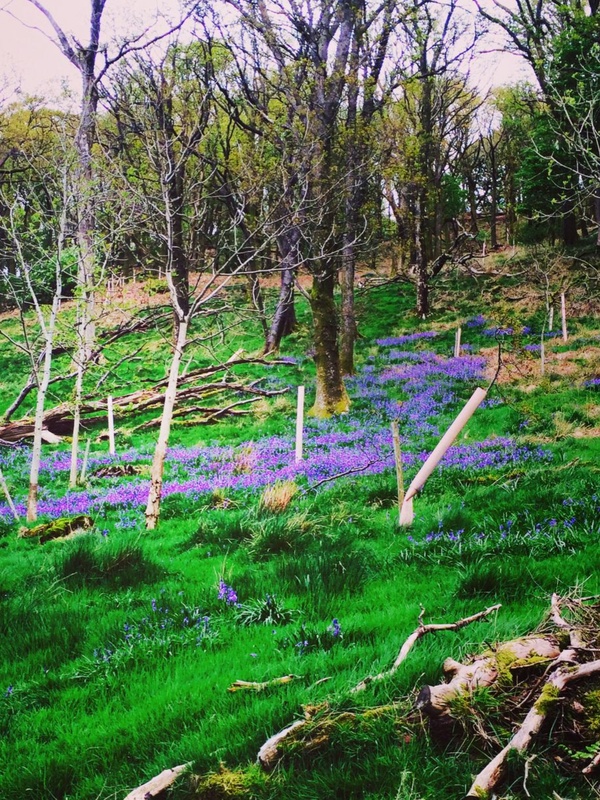 The bluebells, trees, mossy walls, green fields, water features, views old farmhouses, sheep and cattle, rhododendrons and various birds made us ‘ooh’ and ‘ah’ at almost every turn. Our second day was a little more challenging. 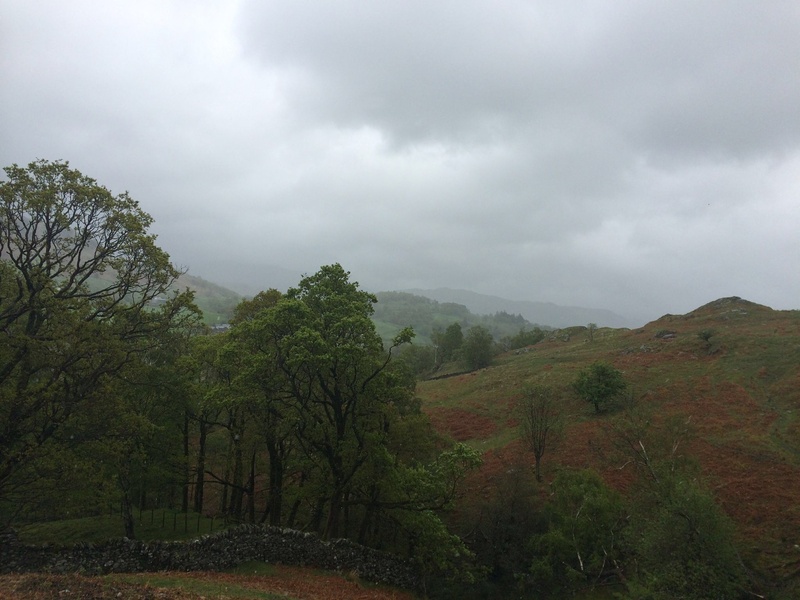 Not only were we walking further but it was raining heavily and the wind on the fells was quite strong. We did very well not to become lost. By the time we reached Coniston our instructions had become like papier-mâché and despite all our wet weather gear the water had managed to seep in here and there. Everything in our backpacks was completely soaked and our room at the B&B looked like a laundry with everything spread out to dry. Our B&B host, Paul met us at the front door where we stripped off our waterproofs and boots which he promptly took off to his drying room. After having a hot bath and hot chocolate we felt contented and caught up with all our emails waiting for dinner time. Fortunately we’d had a full Cumbrian breakfast that morning because there was nowhere to stop to eat along the way and no shelter from the rain. The water ran down the wet gravelly paths. If you walked on them your boots filled with water. If you walked off them your boots filled with mud. Our third and last day for our walk looked more promising. We were dry and warm, we had put everything in our backpacks into plastic bags and it wasn’t raining as we set off! My mission was to keep my feet out of water as I crossed boggy puddles and forded small streams across our paths. My feet were suffering from being soaking wet for 17 of the 19 kms the day before. Things were looking promising as we successfully followed our instructions. We were halfway along our course when I negotiated a slippery wet rocky hill only to hear my husband come crashing down behind me. I was relieved to see him get to his feet but dismayed to see his pinky on his left hand sitting out at right angles to the rest of his fingers. Fortunately we were not far from the village of Hawks Nest. 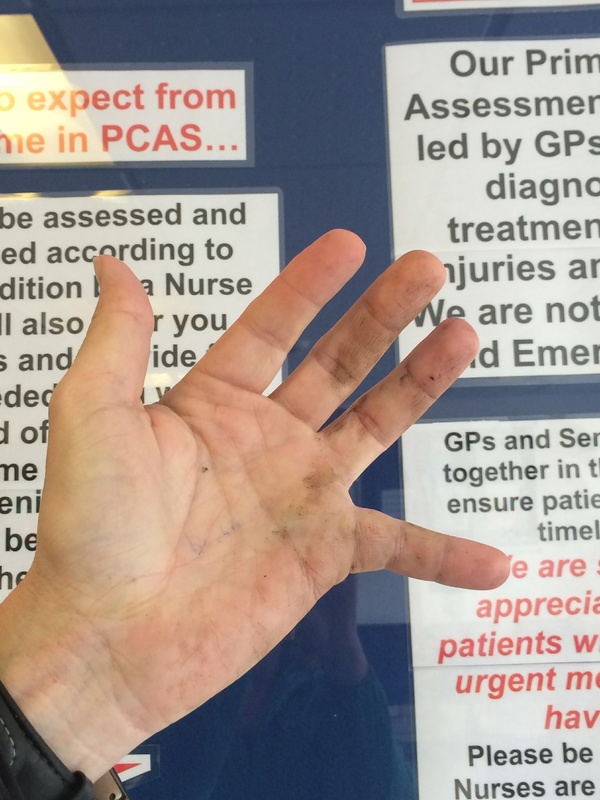 We found the doctor’s surgery but she could not put what we thought was a dislocated finger back into place. Her next patient was the local taxi driver who cancelled his morning’s plans and drove us all the way to the nearest hospital at Kendall. They looked after my husband very well and his hand was x-rayed, diagnosed, the broken and dislocated finger was put back into place, plastered and x-rayed again in under 2 hours. My husband is not usually able to separate his pinky this far from his other fingers. It was broken and dislocated. 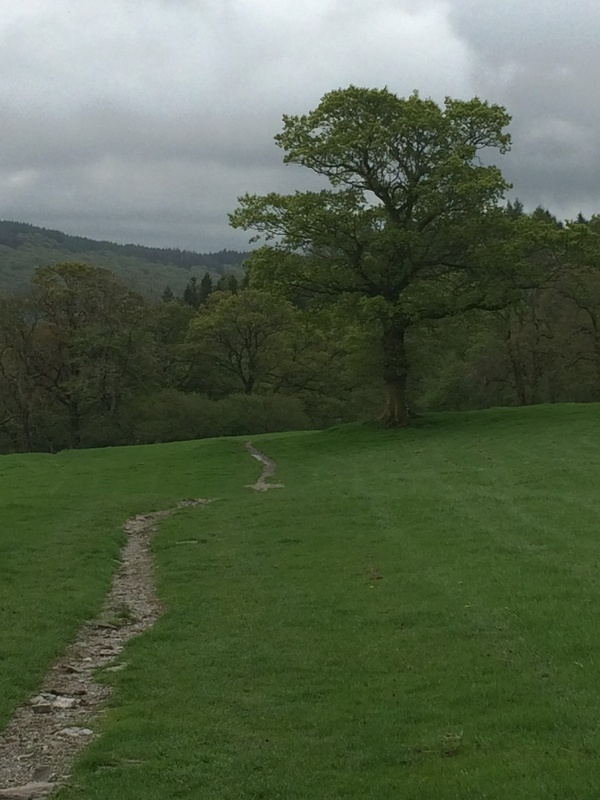 We still had a bit of walking to do as we walked for over a kilometre to Oxenholme railway station in the rain and then down from Windermere station to our B&B which is our final stay in the Lakes District. 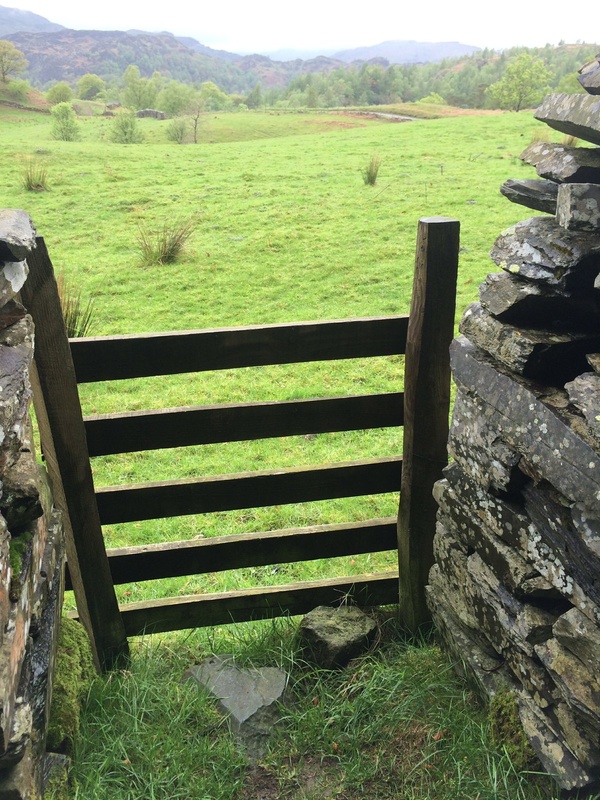 Farewell to the rugged fells and deep green downs. ← New Milton – surrounded by the New Forest, historical towns and the sea.